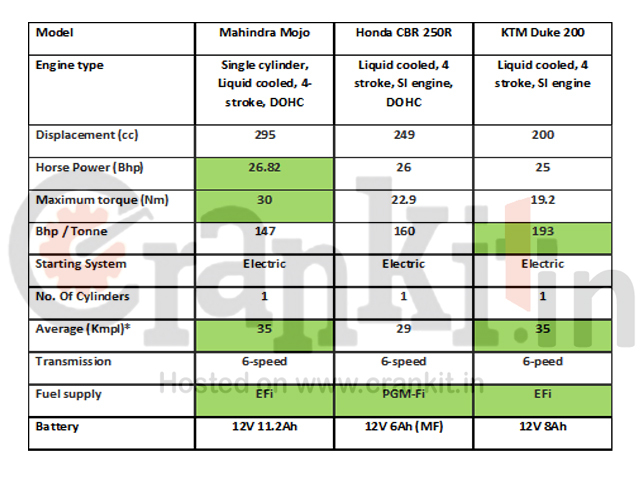 How good is Mahindra Mojo vs Honda CBR250R vs Duke 200? Mahindra two-wheelers had recently launched its much-awaited first sports-tourer bike Mojo in India. The Mojo takes on the Honda CBR250R & KTM Duke200 in the entry-level sports bike segment. We have compared the three 25bhp bikes Mojo vs CBR250R & Duke 200 in the segment. All the three bikes have a single cylinder liquid cooled engine. Mahindra Mojo has most powerful engine delivering a good 26.82bhp; which is only a marginally higher than both the CBR 250R & Duke 200; which give 26 & 25bhp respectively. However, the effective power-to-weight ratio for Mojo is only 147 Bhp/tonne, whereas for CBR 250R it is 160 and for Duke 200 it is 193 bhp/tonne; which is highest in its class. Among the three, the Mojo’s higher torque value of 30Nm is far higher than the figures of CBR 250R’s 22.9 & Duke 200’s 19.2 respectively; which is helpful in its pulling ability. All the three bikes are mated to a 6-speed gearbox. All the three bikes are equipped with an electric start option. In the fuel-economy, both the Mojo and Duke 200 with EFi claims to deliver a decent mileage of 35 Km/L. The Honda CBR 250R gives 29 Km/L. So, overall, Mahindra has managed to strike a balance between power & mileage for Mojo. Both the Mojo & Duke 200 provide ‘Upside Down’ telescopic-hydraulic suspension on the front. On the rear, Mojo provides gas-charged Mono-shock, Honda CBR 250R provides Pro-Link suspension & Duke provides Mono-Shock suspension. All the three bikes compared here provide 17” wheels. All these bikes provide alloy wheels, which add to the ride comfort. The front tyre size on all the three bikes is also same, however; Mojo & Duke 200 provide a slightly wider tyre on the rear. The particular models compared here provide disc brakes on both front & rear. The front disc on the Mojo is biggest in size of 320mm dia. ; whereas that on the Duke 200 it is 300 mm & on CBR 250R it’s 296mm. The rear disc on Mojo is also biggest in size of 240mm dia. On both CBR 250R & Duke 200 it is of 220mm dia. However, among the three bikes, only Honda CBR 250R provides an optional ABS, at a higher price; which is a crucial factor for the long-distance riding in India. The Mojo is the longest among them with 2100 mm length. Among the three, Mojo has longest wheelbase of 1465mm & highest ground clearance of 173.5; which is perfect for Indian conditions. With the biggest fuel tank of 21 litres, the Mojo is a perfect long-distance tourer. However, with just 11 litres fuel tank for Duke 200 is more useful for within-city commute. With just 129.5 kg Duke 200 is the lightest & agile bike among the three. Mojo weighs a whopping 182 kg; making it the heaviest among the three. We could say that Mahindra’s first attempt to make a sports-tourer was quite worthwhile, provided if they had managed to keep its weight under check. Although it ticks most boxes, the 182kg Mojo could lose all its advantage of a powerful engine as most of its power will be used carrying its dead weight. Mahindra has priced the Mojo at Rs. 1,63,000/- (ex.show-Delhi). However, neither Mojo nor Duke 200 comes with an ABS; whereas the CBR 250R provides it optional. With a mileage of 35 Km/L and price-tag of only Rs. 1,43,000/- (ex-showroom), the Duke 200 is the most affordable bike among the three, providing great agility; whereas Mojo’s only advantage lies in its torquey engine.